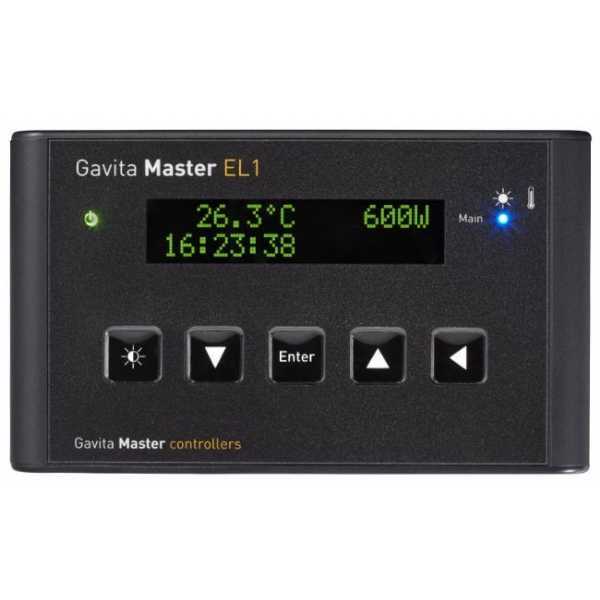 Gavita Master Controller EL1 is a lighting control unit. It offers a maximum control on Gavita E-Series devices, easily used, plug, play and safety. Just connect the controller cables to the fixtures with T - splitter included in the package, set up the dials on the EXT (external control) headlights, connect the controller and the fixtures on the net. The controller can manage all the interconnected devices with its inner timer, adapt them to your level of required output (in percentage or exact output power) and even simulate sunrise and sunset to gradually adjust the climate in your grow room when the lights go on or off. This electronic controller replaces expensive lighting timers and contactors avoiding waste of power when turning on the lights. Two very important features are the autodim and emergency interruption functions. When the temperature in your grow room is more than the level of climate control the harvest may be damaged. The temperature probe detects this problem and will automatically darken the lights in order not to exceed the limit temperature. You can connect all your devices to an e-series controller.